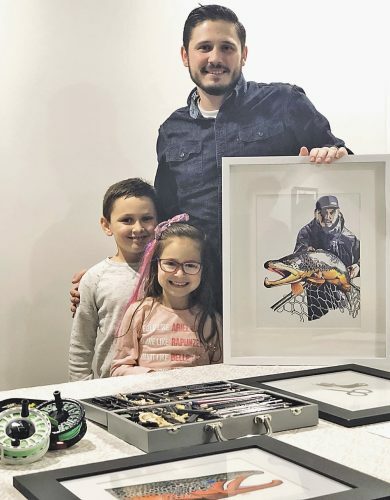 Mirror photo by Patrick Waksmunski / Evan Zimmerman, 3, of Alexandria is wowed by the turtles on display in the newly updated Litzinger Herpetology Center in the original lodge at Shaver’s Creek Environmental Center on Tuesday. PETERSBURG — A 10-pound golden eagle with a twisted beak eyed spectators through a fence guarding its open-air home at the newly renovated Shaver’s Creek Envi­ronmental Center on Tuesday. The eagle, born at ZooAmerica in Hershey, had hit a power line, blowing a hole in its throat and causing its beak to twist, making it difficult for the bird to rip its food into smaller, digestible pieces. Staff at the environmental center breaks up the food for the bird so that it can eat. Shaver’s Creek, which served as an educational conservation facility to Penn State University students and other community members since 1976, closed in fall 2016 to undergo two phases of construction, according to the marketing coordinator Justin Raymond. It celebrated its grand reopening Saturday evening. Shaver’s Creek officially started being open to the public on Sunday. The first phase of the center’s construction included additions to the 1930s forestry lodge space, a new classroom that can fit about 100 people and updates to the heating, ventilating and air conditioning systems and lighting. The second phase, expected to be completed by mid-October, includes the construction of the Raptor Center and a new classroom up the hill from the center. Jason Beale, Shaver’s Creek animal care program director, said it is exciting to see the environmental center re-emerge and present itself to the public after being closed for two years. He said the reopening gives both Penn State University and Juniata College students a chance to show off the work they’ve been doing at the environmental center and to engage with the public as educators. 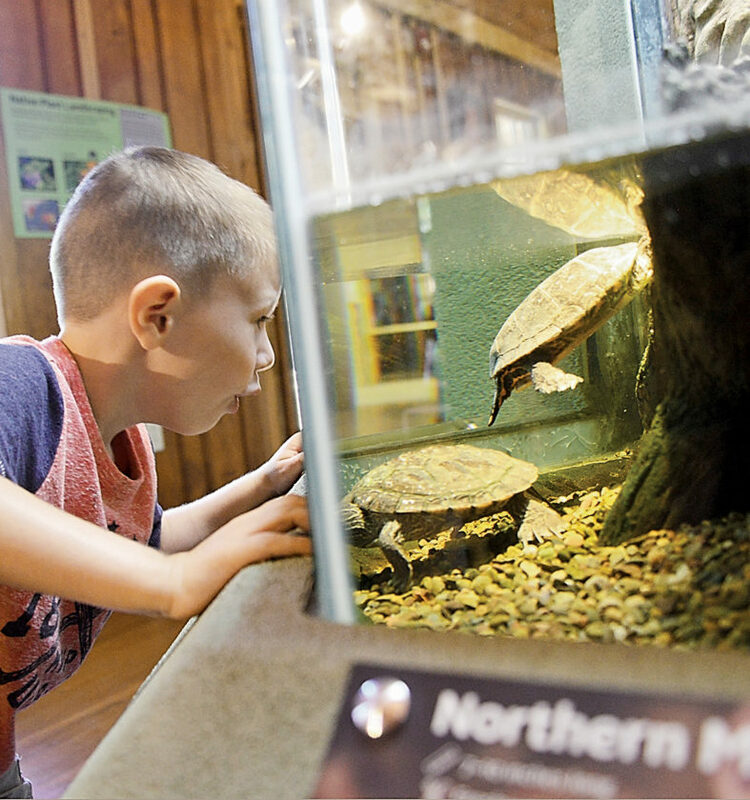 Shaver’s Creek is open to the public every day from 10 a.m. to 5 p.m.
Christie and Dustin Brown visited the center Tuesday morning with their child, Owen, directing their son’s eyes to a turtle behind a glass display as part of a new herpetology center in the forestry lodge. Both Christie and Dustin had seen Shaver’s Creek prior to its renovations. Dustin added he thinks the new spaces for the animals look a lot more spacious and realistic to natural habitats. The environmental center will host a “Capturing a Changing Landscape” book signing event at 6:30 p.m. Sept. 12. Shaver’s Creek also plans to host its family-friendly Enchanted Halloween Trail and Festival Oct. 20 and 21 and its spring Maple Harvest Festival in March. While admission to the center is free, there will be a small fee to attend the festivals, Raymond said. The environmental center will close for break from mid-December to mid-February. During the two years of closure, most of the classes previously offered at the environmental center had been moved to other locations while staff worked in temporary outbuildings. There were some summer camps still running while the center underwent construction. The center’s instructors teach more than 35 classes for six colleges and nine departments, states its website. Shaver’s Creek is located about 12 miles from Penn State’s University Park campus and is a short hike from the Stone Valley Recreation Area. “We want people to leave Shaver’s Creek inspired, not only engaging in conservation behaviors, but being an ambassador for conservation with their friends and family,” Beale said.